Choose blue dinnerware and cookware for traditional kitchens and decor. Tables set with blue and white dishes have long been a traditional favorite in many homes. Most dinnerware designers and manufacturers have at least one blue and white pattern in their portfolio because it's so loved by homemakers and entertainers everywhere. I have an assortment of blue and white dishes, from fine china to basic crockery. My family uses them as mix and match place settings every day and they have served me well during the 30 years that I've been cooking and serving meals for my family. I suppose I'm considered a quasi-collector of blue dishes. Not that I intentionally collect them but whenever I go shopping for tableware I migrate over to the blue and white section automatically. And now that shopping is more convenient that ever with on line venues like Amazon, all I have to do is type "blue dishes" into google and I can browse for hours. I've assembled some of my favorites here for your viewing pleasure. Villeroy & Boch started in business in 1748 in a tiny village in France, when the founder Francois Boch began making simple ceramic tableware, and has since grown into an international designer of tableware; bathroom products such as bathroom saunas, whirlpools, and hot tubs; and tiles. The company has over 260 years of expertise the quality of Villeroy & Boch products is second to none. Through the company's history it has moved from France to Luxemburg, and finally to Mettlach, Germany, where the headquarters is today. I love their dinnerware. They have lines of fine china and porcelain, as well as earthenware. All are made in beautiful coordinating colors and shapes, which lends themselves to mix and match style entertaining. I'm such a fan of blue design china that I love to browse their patterns and plan out table settings I would love to create. Porteirion Potteries was founded in 1960 by Susan Williams-Ellis in the town of Portmeirion Village, Wales. Her early patterns, Malachite and Moss Agate were unique in design and style for the time and received high acclaim. Susan was able to purchase a pottery making company in Stoke-on-Trent, England, where Portmeirion Potteries is still located. The most popular tableware pattern, Botanic Garden, was created in 1972 and remains a best seller. Susan Williams-Ellis passed away in 2007 but the company is still turning out beautiful and innovative new designs. In 2009 the company purchased Royal Worcester and Spode, and Portmeirion continues to grow internationally. Portmeirion dinnerware is casual and fits comfortably with today's modern life. It is affordable and has a huge wordwide fan base. The pottery is made with layered glazes and the blue hues in particular are soft and reminiscent of country designs. Tableware sets and gifts come packaged in a Portmeirion hat box, making their storage as beautiful as their use. Scandinavian design has been popular in the United States since the 1950s, when sleek clean lines and shapes of the Eames era made their way into American homes. The Dansk Company was formed by a couple that recognized the need for casual dinnerware that fit the new less formal tastes of families. Ted and Martha Neirenberg began searching European design houses looking for elegant, yet simple forms and materials in dinnerware that could be exported to America at affordable prices. Danish artist Jens Quistgaard was their choice to create the clean modern dishware in a style that is synonymous with the Dansk Company. For over 60 years Dansk has been making entertaining and dining more enjoyable all over the world. Dansk now owns the Lenox table top and giftware company, and Gorham silver. The quality of the brands is stronger than ever and the durability and elegance of all the Dansk family of products is second to none. There are many beautiful Dansk blue dishes that can be conveniently purchased on the internet and delivered directly to your home. I like the bright blue patterns against the stark white backgrounds. The look is clean and modern. 50's Inspiration. Modern Sensibility. The Kobenstyle Blue 4-Piece Dinner Set by Dansk is designed to brighten any meal with its mix of gleaming white and vibrant color. 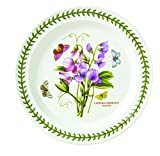 Enjoy the beauty of flowers at every meal with this Dansk Silhuet dinner plate. A graceful floral motif, in a watercolor style, decorates the white-bodied dish. Polish Pottery from Boleslawiec, Poland are some of my favorite types of dinnerware and serving pieces to use. The brilliant blue and colored patterns are eye catching and functional. And there are so many unique styles and pieces that aren't typically included in traditional dinnerware sets. Take the Bunzlauer Polish Pottery Butter Lady shown here, for example. Her big country farm skirt covers the butter in a folk artsy style. She's sure to be a conversation piece at any gathering. The inspiration for Polish pottery designs is from the proud peacock. The original designs were used at the tables of Polish farmers to brighten their tables. There are some beautiful holiday designs too. Check out the charming blue dishes for your Christmas entertaining featured below. Boleslawiec Stoneware - Polish Pottery 16 oz Bubble Coffee or Tea Mug - Eva's Collection "Isabelle"
In your favorite patterns! Cake plate - 9.5" diameter, 5.5" high. Johnson Brothers China was started in 1882 by three brothers who bought a bankrupt dishware company in England. The developed a durable and inexpensive earthenware called White Granite which became very popular and gave them a good start in the business. Later they created a semi-porcelain that was as durable as ironstone, yet as delicate as fine china. This became their signature line. Now owned by the Wedgwood company, one of the great-grandsons of the original founders still oversees the brand from the Wedgwood board of directors. In 1970 Johnson Brothers China won the prestigious royal warrants of both Her Majesty the Queen and Her Majesty the Queen Mother. Blue Willow is one of the oldest and most popular patterns and different versions of this classic have been made by dozens of china and earthenware companies. I have Blue Willow by Johnson Brothers along with a few Old Britain Castles and Blue Denmark pieces. My Johnson Brothers dishes have lasted through a large and busy family's heavy daily use and remain one of my favorite dinnerware brands. LeCreuset is famous for their enameled cast iron cookware. Since 1924 the company has been making brightly colored original pans, cookers, and utensils. The original LeCreuset is located in northern France in a country setting and in the 1970's set up a factory in South Carolina in the United States. These days Le Creuset is a major manufacturer of stoneware, baking and prep accessories, and storage pieces in addition to a large line of cast iron cookware. The beautiful enamel colors have evolved and there are lots of coordinating pieces, of which the blue is a traditional favorite. I use the serving pieces for everything from baking, broiling, and serving, to storage in the refrigerator for heating the next day. The Spode Company was founded by Josiah Spode in 1784 in Stoke-On-Trent, England. He was responsible for developing a blue underglaze process and also the formula for bone china. He started his business making creamware, and pearlware, which are high quality earthenware. Today the Spode brand is owned by the Portmeirion Pottery Company. 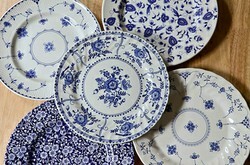 Some favorite Spode patterns are the Blue Italian, Woodland, Christmas Tree, and Baking Days collections. They also make fine decorative collectibles and Spode antiques are highly sought after collectibles. Thanks Kimbesa, that means a lot coming from a dishie expert! I really like blue, and those blue and white china patterns are classic! My collection includes only the mugs that have a Starbucks Logo or sign somewhere in the painting. See if you recognize the art - and find the Starbucks icon. Saying goodbye to my charming Starbucks Christmas Coffee Mug collection. Just a few thoughts and photos before they travel to new homes.